Here is another mod reawaken by a modder. City, Wall and Ruin Generators 1.7.2 is a new update of 3 mods that stopped updating long time ago and that a modder has combined to use this 3-pack mods in one installation. CARuins Mod: who is responsible for generating various types of ruinous structures for Minecraft. City Walled Mod: is a generator of large cities, with 8 variants. Great Wall Mod: generator walls, roads and structures. How to install City, Wall and Ruin Generators Mod for Minecraft 1.7.2? Double click the Forge downloaded file to run the Forge installer. 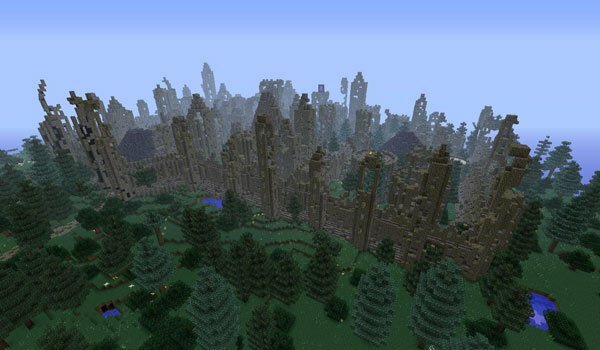 Generation of cities, dungeons, ruins and walls in Minecraft! The Cities do not spawn, I have edited the config file but none spawn, what do I do? You have to take the generator mod out of the tempelates zip file and place that in the config.